I have started to see a disconnect between what I value and the amount of time devoted to my values. With value-based planning and living I have added purpose and power to my life. I need it right now. I have encouraged my students all semester long to be gritty and now it is my turn to dig deep and find the will to keep going. I got sick yesterday and it has given me some perspective. I literally spent all day on the couch. My children watched two movies, and I barely had the strength to change diapers and feed my little ones. My husband graciously took a half day of work off to help with the children, house and me. Nothing completely fell apart while I slept and did nothing. My mind was active, but it was also aware of my body’s limitations and I was able to rest. Today I am still not 100%, but I was able to take care of the home a bit better and interact with my kids more. The weight of the to-do list and never-ending self-inflicted pressure to do something started to weigh heavy on me again. I want to let go of some of the stress, but I think I know that it fuels me. For some reason, I feel the clock ticking on my time here on Earth and I want to leave behind something worthwhile. I have not accomplished some big goals of mine and I don’t intend to wait to work towards those goals. Maybe for some, pounding it out is exactly how they do it, but for me, I have to find a way to devote my time strategically to my family, others and my own personal pursuits. But I confess my strategy stinks most the time. I am the sprinter who goes super fast and then is huffing and puffing. I have to take a break and I nearly give up because after so much work, the results are not gratifying enough. Then I have to re-access and gear myself up for the next sprint. I do not recommend this to anyone because it is disorienting for my family and honestly is is more exhausting than if I would just steadily do small amounts daily. I believe the sprint method has been my go-to because I don’t get large pockets of time to devote on any one thing hardly ever! And when I get the time, I sprint or lose it all together. Anyone relate? So, to improve my time management, I am planning my days and really my life in a new way. I call it value-based planning and living. If I were to put my priorities on a list, I want to divide my time in a way that reflect my values. Prayer morning and night and a prayer in my heart always. Read scriptures on my own and with my family. Exercise, shower, do my hair and makeup, put on “good” clothes (not sweat pants and an old t-shirt), read, meditate and plan. I would want to get to a place where I am doing the morning miracle again. I would love to have this all done before my family needs me. Right now all of these things happens throughout the day when I can or not at all-it depends on the day. I think that is why I like to work a couple times a week; it forces me to get ready and take care of myself. Of all the values I list, I am the least committed to this one. I am a work in progress. Meal prep, laundry, dishes, budgeting, appointments, cleaning, organizing, teaching/homework help, family home evening preparation. The list goes on, but I trust most of you can fill in the blanks. Outings, activities, dinners and informal gatherings. I like to spend time with a friend(s) once a week either through an activity or serving them. The rest of my values are either clumped with the more broad ones I have listed or less important and also rotate around depending on the season of my life. The ones I have listed are ones that have been consistent in my life and when I prioritize with these in mind I am more happy. I have also seen that if priorities that are not even listed take up most of my time, I am very unhappy. I feel like I am wasting away my life. I have always appreciated people that remind me that grace is a huge part of planning. It is so important to make plans and goals, but just as important to learn from your failures and try again. Now it is your turn to write down your values and start planning with them in mind. It helps me to be able to let go of certain parts of my life when I recognize I am living according to my values. I feel more authentic and full of purpose when I plan my days this way. I get sidetracked by sales, media and other less important distractions. When we “value” something we will pay it its proper dues; in this case we allot it the amount of time it deserves. Since I cannot control everything, I feel excited when I can control my own choices and align them with my values. This is not a perfect system where all of your value action lists get done, but I sleep easier and usually get more done when I start with the most important and then work my way down. I also love how this strategy can work for anyone no matter what you believe. There will be a greater commitment to your actions because you have likely chosen your values over a lifetime of experience and pondering. 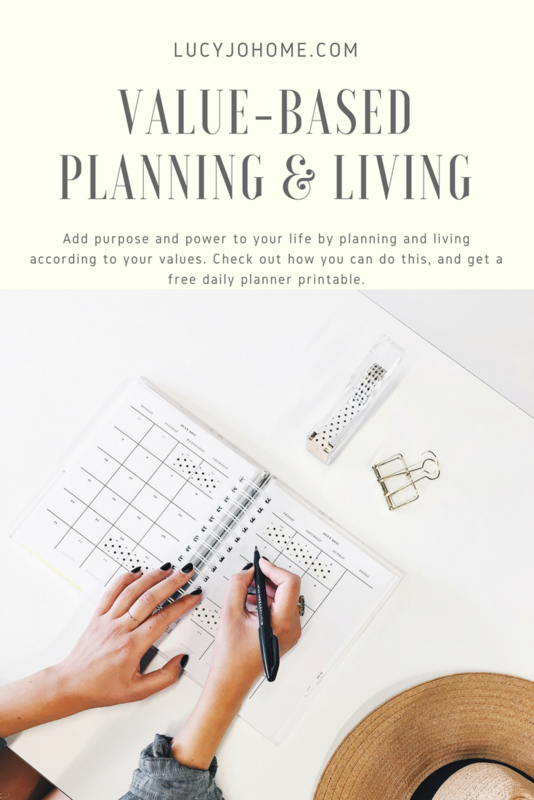 I have created a free printable that you can use to plan with your values in mind. I hope it will add greater light and purpose into your life. Keep trying and keep learning!